This entry was posted in M&M Gems and tagged Alan Page, Cafe 101, Devan Dignan, Don Drysdale, Harry Carson, John Elway, Martin Brodeur, Mickey Mantle, Nolan Ryan, Tony Gonzalez. Bookmark the permalink. I suspect that, without question, table #22 will go to the great, Buck O’Neil? Buck O’Neil will definitely be considered for Table 22 but that’s going to be another really tough table to decide. Unlike prior posts where it was about my personal favorites – this is about choosing the greatest to ever wear the number so it becomes a challenge. You’ll have to keep reading Cafe 101 to find out! Thanks for reading! If you wish for updates you can subscribe via email in the upper right. So clearly I’m completely on board with the Elway pick, easily the best to wear #7. It would of been nice to see two Broncos get in, #30 could of went to TD if it wasn’t for his injuries! As much as it pains me to say it, I really think you snubbed Tony Gonzalez deserved his seat. What he’s done as a TE Iis incredible. Terrell Davis would’ve been a great pick but when you have the best strikeout pitcher and the best goaltender of all time at #30 – it was really tough for him to get a fair shake. I went back and forth and Ryan and Brodeur for quite awhile. I agree with you fully on the Tony Gonzalez pick and he would have been deserving. He is one of my favorite football players of all time (I like Tony G. better than Alan Page even though Alan Page is a Viking) and I easily could’ve gone with Michael Irvin. What it came down to for me between Gonzalez and Page is that while both are probably the best ever at their particular positions, Page won his team 4 NFC Championships while Gonzalez has yet to win a playoff game. The tipping point for me was that Page was the first defensive player to win the NFL MVP award and that’s tough to do. This was one of the toughest picks I had to make and it’s one where a year from now my mind could easily change. 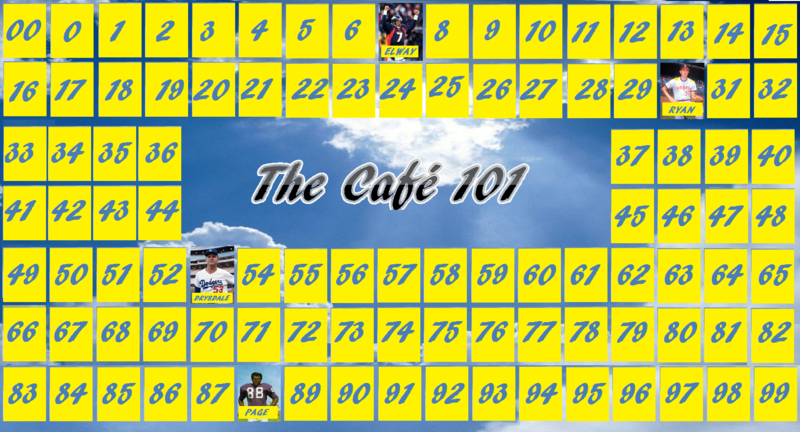 But I do appreciate your feedback and hope you’ll keep reading and tell your friends about the Cafe 101 series! There is 9 tables I just took care of for you…..You’re Welcome…..